Because just about everyone has one, right? 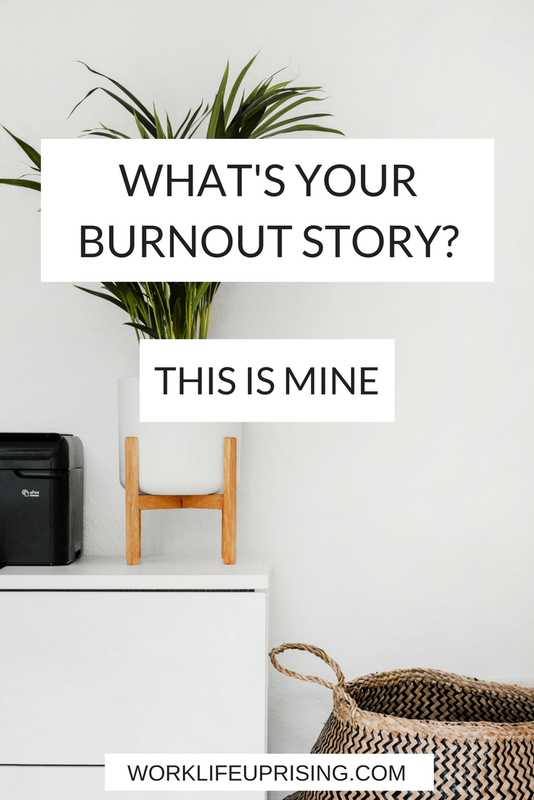 It's hard to find someone who hasn't had an experience with burnout. I certainly have. And it wasn't pretty. Years ago I was working as an administrative assistant. It was a good job and I worked with great people. It was challenging work in a fast-paced environment - lots of deadlines to meet and massive amounts of work. I enjoyed my work and I was good at it. And I took pride in doing my job well. But as the weeks and months went by and I focused all of my energy on the massive amounts of work I had to do, it slowly started taking a toll. I'd come home exhausted just about every night. And spend most of my free time vegging out on the couch. These were pre-Netflix days (I know, the Stone Age, right?) so I spent a lot of time, remote-in-hand, mindlessly flipping channels. Alarm clock goes off - hit the snooze button two or three times (who am I kidding, some mornings it was at least half a dozen) and get up at the last possible moment. Shower. Put on my black dress pants, a collared shirt, throw in some earrings and run out the door. Drive to work. Work. Come home. Flop on the couch with a glass of Merlot. Stay up way too late watching Letterman and then more channel-flipping. Lather, rinse repeat. My day-to-day life had become a monotonous routine. And then finally Friday would come. TGIF! Hooray! But, UGH. Laundry and dishes and chores, oh my. I'd fantasize all week about the awesome stuff I wanted to do over the weekend. I'd plan to work on the scarf I'd started crocheting and take the dogs out for a hike in the woods and go to the art museum to see the new photography exhibit. But by the time Saturday and Sunday rolled around I was pretty drained. And usually, I didn't have the energy to do any of the fun things I'd imagined. And as the months and years went by, I threw all of my fantasy plans out the window and looked forward to vegging all weekend long. So I'd work like a crazy person all week and "recover" by being a couch potato most weekends. I'm sure I don't have to tell you that it was not a party. And it's hard to admit that I lived that way for so long. Fortunately, one day I realized what was going on - the rut I'd gotten myself into. I felt like I was asleep in my own life and finally woke up. I'd become a work zombie. And when I finally "woke up" I realized I needed to make some serious changes. If I'm being totally honest, it took me longer to recover from burnout than I'd like. I needed time to figure out what I needed and how to make it happen. And a significant part of that was remembering and reconnecting with who I was and the things I enjoyed. Because truthfully, I'd forgotten. In the years since, I've discovered it's a continual process of keeping myself in check and staying on top of my self-care. And making sure I'm making myself - my needs, wants and desires - a priority. Being a happy, fully-functioning human (and not a zombie) requires regular maintenance. Who knew?! I also learned that self-care is different for everyone - it's way more than pedicures and bubble baths. (Thank goodness, because those really aren't my thing.) It's about staying connected with who YOU are and what YOU need. This is why I work with people to help them prevent burnout. Because I don't want you to become a work zombie like I did. And if you're already there - if you recognize yourself in my story - I want to help you recover and prevent it from happening again. I'm here to use what I've learned to help you. I'm not going to lie - I don't have a magic wand or a quick fix. Doing the work to recover from burnout takes effort. You have to be ready. But your recovery doesn't have to be as hard-fought as mine. I wish I'd had someone to go to for guidance back then. I needed someone to help me skip the messy bits and figure out what the heck I needed to do. A cheerleader to help me remember that change was possible and I could do it. Someone to help me patch myself up and show me how to prevent the burnout cycle from starting all over again. My mission is to be that person for you. To use what I've learned to help guide you through it. Are you ready? Learn more about how to work with me HERE.